I figured that since Bobby Doerr and Sparky Anderson each got a post from this set, Eck might as well get one, too. 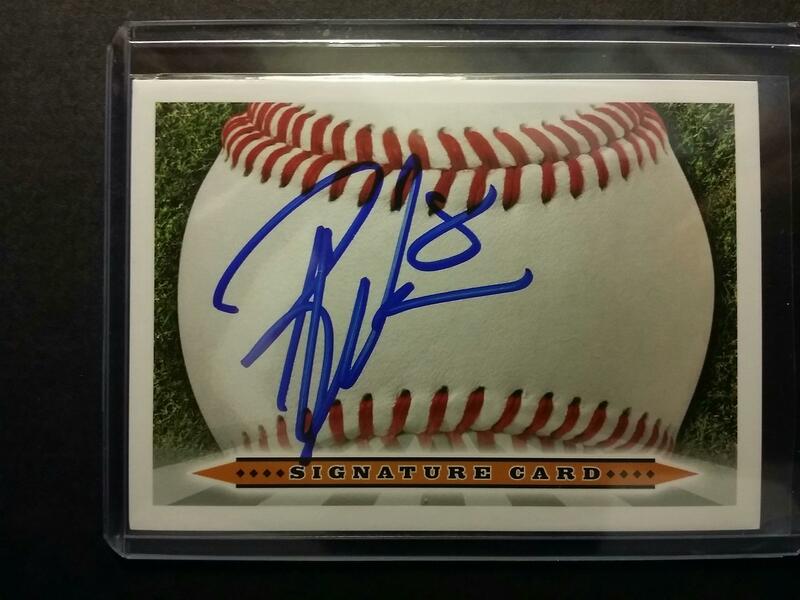 So, here is the third and final card that I got him to sign at the College World Series in 2014. My main focus at the event was getting his '81 Donruss signed. After that, I had this card and his '87 Fleer card and it didn't really matter which one got signed. In the line, I had the '81D and my wife had the other two cards. Somehow, she sweet-talked her way into getting both of them signed by him. She never ceases to amaze me. Anymore, when retired players appear in modern sets, I would much rather get an original card of theirs signed instead of one after they retired. And, while I wanted a signed card of Dennis with the A's, he was with them during the junk wax era. So, when it came down to taking a 1990 Donruss card or this one, this was the easy choice. Dennis pitched for the A's for nine seasons and was phenomenal. After being a starter his whole career, the A's threw him out of the bullpen and it resurrected his career. During his tenure in Oakland, he went 41-31 with 320 saves and a 2.74 ERA. He made four All Star teams with them and lead the league in saves twice, including his career high of 51 in 1992. Plus, he helped the club to the postseason four times and helped them to the championship in 1989. For a couple of years, the CWS stopped doing autograph signings. It was kind of a bummer because I was so used to coming home from Omaha with autographs like this. Then last year, they started it back up again. The only difference was that they were during the week instead of the weekend. The day I was there last summer was supposed to have Ryan Howard signing. But, some crazy weather hit town and it got cancelled. 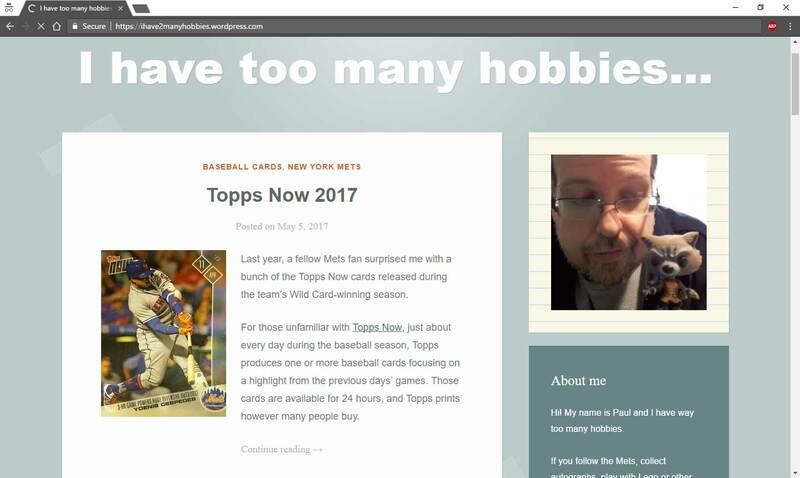 So, you will not be seeing a signed 2008 Goudey Ryan Howard on here. I posted the first two cards of Dennis two years ago. His '81D can be seen here and his '87 Fleer here. 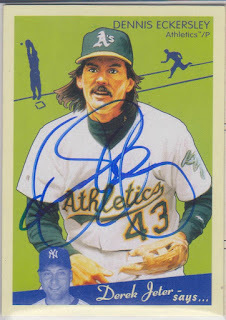 Eck was the man back in the day. 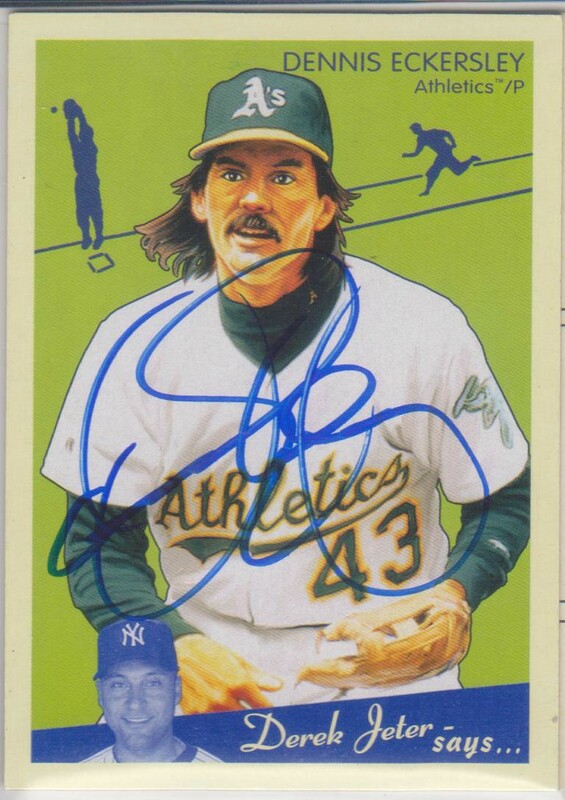 The A's have been blessed with a bunch of legendary closers... but Eck was the cream of the crop.